There are two types of people — those who wait to talk and those who listen. In the Dolby� surround sound of our daily lives, we all have to find our own mute button. 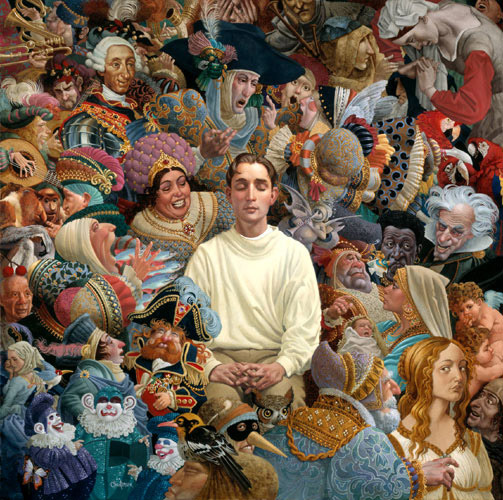 "Since a painting has no soundtrack, the title character at the center of The Listener has found the best way to shut off all the noise in the visual cacophony around him by closing his eyes," Christensen says. "Listening to his still, small, inner-voice, he remains centered without being overcome. We can all find peace in this busy world, but sometimes need to be reminded that we are in charge of our destiny and each of us has the ability to focus without being pushed and pulled as victims." The characters found in the colorful "noise" around the listener in this painting take many forms including politicians, mothers-in-law, musicians, and famous artists... can you find Picasso? Through it all, our listener ignores the noise in favor of his own personal tranquility. 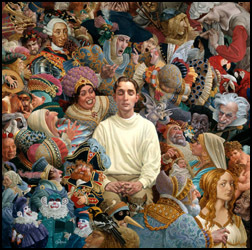 The Listener copyright© 2006 by James C. Christensen is prohibited from being copied.